Welcome to Harvester Park Little League's home on the web! Serving Burr Ridge, Darien, Willowbrook, Willow Springs, and Indian Head Park. Representing the communities of Burr Ridge, Darien, Willowbrook, Willow Springs, Indian Head Park as the introduction to organized youth baseball, we hope you and your child will have a very enjoyable season. 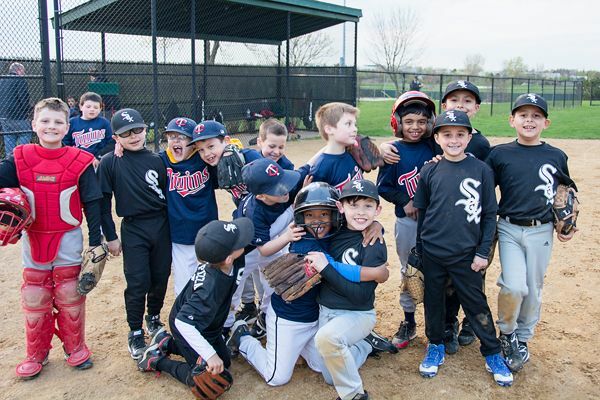 Our program is open to all players and emphasizes fundamental baseball in a positive atmosphere, where the main goals are learning the game and having fun. Click the REGISTER ONLINE LINK located on the left side tab. For more details on our league about dates, times and divisions, please see our Information Page or FAQ section. Top 10 Things Your Kid Wants You To Do! "Organized youth sport is a valuable form of recreation for millions of children (Weinberg & Gould, 2007) made possible by substantial adult involvement (Weiss & Fretwell, 2005). Coaches and parents can be a source of support or a source of stress throughout the "sport careers" of young athletes (Fredricks & Eccles, 2004; Smith & Smoll, 2007). Some adults may behave in ways that promote stress in children simply because they do not understand how children want them to behave (Omli, LaVoi, & Wiese-Bjornstal, 2008)." We hear the extreme stories in the news: "Youth league parent jailed for punching coach (or umpire)". Umpires tell me there is more yelling and jeers from parents at youth levels than at the high school and college levels. We see it in more subtle ways in players as a youth league coach. Coaching kids from the stands or by the fence, kids do worse because they are confused that the coach is telling them one thing and a parent another. Parents who criticize for every out or error that leads to kids being overly critical of their own performance. The exceedingly high expectations parents place on them can't be met so kids tense up and under-perform. So what's the primary solution? The development of new educational programs for parents at the local league levels? A greater emphasis in umpires ejecting parents for disruptive behavior? The simple solution is to listen to what your kids want. Go to their games and watch them play. Tell them that they did a good job. Clap after their team does something good. Encourage them after the game if their team lost. Encourage them while they are playing. Say “good try” if they make a mistake. Bring treats for them and their teammates. Take pictures or video of the game while they play. Compliment the umpire or referee if they make a good call. Tell them to break the rules. Swear or say “bad words” loud enough for them to hear. Say mean things to the other team or umpires. Yell at them if they make a mistake. Argue with parents from the other team. Pass this article along to parents, coaches or anyone associated with youth sports. Let's have a great season out there. A good article if you want to read more about Dr. Omil's research. QUIZ: What Type of Youth League Parent Are You? Harvester Park Little League and Hammers Baseball are now on Facebook! We are pleased to announce that Harvester Park Little League (HPLL) is now on Facebook. HPLL is looking to make this a hub for our league. The goal for the Facebook page is to have another way to connect with all of you. Not only will we update Facebook with important league events and announcements but we will be consistently sharing links from around the web that we think may be of interest to you and will be looking for more and more ways to connect with you. We invite you to "Like" us so you can stay up to date with all things HPLL and Hammers. Please share our page with friends, share interesting links that you may find, start discussion threads and have fun! Feel free to post, ask questions and connect with your fellow members. We welcome your feedback! Harvester Park Field Rainout Line. Smartphone users - Can download the app from the App Store, Google Play, Amazon Apps and or sign up for text email alerts through the site.